Explore the wonders of earth science through 52 activities. A technical writer and longtime rock hound invites young readers to learn about geology through hands-on projects, many of which involve models that double as tasty treats. The introduction includes a spread of labeled rock samples. Opening with a simple activity to demonstrate crystal formation using supersaturated sugar water, author Romaine goes on to explore rock characteristics, molten rock (lava), sediments, metamorphosis, entropy, our active planet, fossils, precious metals, space rocks, and rocks in art. Each chapter begins with a spread of explanation opposite a full-page photograph of the natural phenomenon under discussion. Each lab includes a list of materials, step-by-step instructions, some safety tips and enrichment suggestions, and a boxed explanation of “the science behind the fun.” Each is illustrated with photos of the activity in progress, often including young experimenters (a diverse group of boys and girls) clearly enjoying their experience. The materials called for are simple and easily available. The time involved ranges from a few minutes to several days. Specialized vocabulary is defined in context. 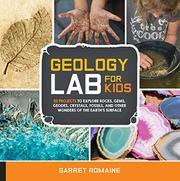 The author has spent many years doing geology with kids; his projects have obvious child-appeal.